An LED is a special type of semiconductor diode. Like a normal diode, it consists of a chip of semiconducting material impregnated, or doped, with impurities to create a structure called a p-n junction. Charge-carriers - electrons and holes flow into the junction from electrodes with different voltages. When an electron meets a hole, it falls into a lower energy level, and releases energy in the form of a photon as it does so. The wavelength of the light emitted, and therefore its color, depends on the bandgap energy of the materials forming the pn junction. A normal diode, typically made of silicon or germanium, emits invisible far-infrared light, but the materials used for an LED have bandgap energies corresponding to near-infrared, visible or near-ultraviolet light. Unlike incandescent light bulbs, which can operate with either AC or DC, LEDs require a DC supply of the correct electrical polarity. When the voltage across the pn junction is in the correct direction, a significant current flows and the device is said to be forward-biased. If the voltage is of the wrong polarity, the device is said to be reverse biased, very little current flows, and no light is emitted. Most LEDs have low reverse breakdown voltage ratings and will be damaged by an applied reverse voltage of more than a few volts. Because the voltage versus current characteristics of an LED are much like any diode, they can be destroyed by connecting them to a voltage source higher than their turn-on voltage. A good LED driver circuit is either a constant current source or an approximation to a current source made by connecting the LED in series with a current limiting resistor to a voltage source. The voltage drop across a forward-biased LED can change significantly based on current flow. Parallel operation is generally problematic. The LEDs have to be of the same type in order to have a similar forward voltage. Even then, variations in the manufacturing process can make the odds of satisfactory operation low. For more information see Nichia Application Note (http://www.nichia.co.jp/specification/appli/electrical.pdf). 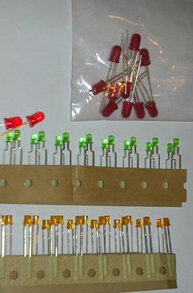 Some LED units contain two diodes, one in each direction (that is, two diodes in inverse parallel) and each a different color (typically red and green), allowing two-color operation or a range of apparent colors to be created by altering the percentage of time the voltage is in each polarity. Other LED units contain two or more diodes (of different colors) arranged in either a common anode or common cathode configuration. These can be driven to different colors without reversing the polarity. Note that some manufacturers may not follow these standards, so if possible it should be looked-up first, or tested in series with a resistor. LED development began with infrared and red devices made with gallium arsenide. Advances in materials science have made possible the production of devices with ever shorter wavelengths, producing light in a variety of colors. Commercially viable blue LEDs based on the wide bandgap semiconductor gallium nitride were invented by Shuji Nakamura while working in Japan at Nichia Corporation in 1993 and became widely available in the late 1990s. They can be added to existing red and green LEDs to produce white light. Most "white" LEDs in production today use a 450 nm – 470 nm blue GaN (gallium nitride) LED covered by a yellowish phosphor coating usually made of cerium-doped yttrium aluminium garnet (YAG:Ce) crystals which have been powdered and bound in a type of viscous adhesive. The LED chip emits blue light, part of which is converted to yellow by the YAG:Ce. The single crystal form of Ce:YAG is actually considered a scintillator rather than a phosphor. Since yellow light stimulates the red and green receptors of the eye, the resulting mix of blue and yellow light gives the appearance of white. White LEDs can also be made by coating near ultraviolet (NUV) emitting LEDs with a mixture of high efficiency europium based red and blue emitting phosphors plus green emitting copper and aluminium doped zinc sulfide (ZnS:Cu,Al). This is a method analogous to the way fluorescent lamps lights work. Recent color developments include pink and purple. They consist of one or two phosphor layers over a blue LED chip. The first phosphor layer of a pink LED is a yellow glowing one, and the second phosphor layer is either red or orange glowing. Purple LEDs are blue LEDs with an orange glowing phosphor over the chip. Some pink LEDs have run into issues. For example, some are blue LEDs painted with fluorescent paint or fingernail polish that can wear off, and some are white LEDs with a pink phosphor or dye that unfortunately fades after a short time. Ultraviolet, blue, pure green, white, pink and purple LEDs are relatively expensive compared to the more common reds, oranges, greens, yellows and infrareds and are thus less commonly used in commercial applications. If the emissive layer material of an LED is an organic compound, it is known as an Organic Light Emitting Diode (OLED). To function as a semiconductor, the organic emissive material must have conjugated pi bonds. The emissive material can be a small organic molecule in a crystalline phase, or a polymer. Polymer materials can be flexible; such LEDs are known as PLEDs or FLEDs. Most typical LEDs are designed to operate with no more than 30-60 milliwatts of electrical power. Around 1999, commercial LEDs capable of continuous use at one watt of input power were introduced. These LEDs used much larger semiconductor die sizes to handle the large power input. As well, the semiconductor dies were mounted to metal slugs to allow for heat removal from the LED die. In 2002, 5-watt LEDs were available with efficiencies of 18-22 lumens per watt. It is projected that by 2005, 10-watt units will be available with efficiencies of 60 lumens per watt. These devices will produce about as much light as a common 50-watt incandescent bulb, and will facilitate use of LEDs for general illumination needs. In September 2003 a new type of blue LED was demonstrated by the company Cree, Inc. to have 35% efficiency at 20 mA. This produced a commercially packaged white light having 65 lumens per watt at 20 mA, becoming the brightest white LED commercially available at the time. Today, OLEDs operate at substantially lower efficiency than inorganic (crystaline) LEDs. The best efficiency of an OLED so far is about 10%. These promise to be much cheaper to fabricate than inorganic LEDs, and large arrays of them can be deposited on a screen using simple printing methods to create a color graphic display so there are compensating benefits. LEDs are capable of emitting light of an intended color without the use of color filters that traditional lighting methods require. The shape of the LED package allows light to be focused. Incandescent and fluorescent sources often require an external reflector to collect light and direct it in a useable manner. LEDs are built inside solid cases that protect them, making them hard to break and extremely durable. LEDs have an extremely long life span: twice as long as the best fluorescent bulbs and twenty times longer than the best incandescent bulbs. LEDs offer benefits in terms of maintenance and safety. The typical working lifetime of a device, including the bulb, is ten years, which is much longer than the lifetimes of most other light sources. Further, LEDs fail by dimming over time, rather than the abrupt burn-out of incandescent bulbs. LEDs give off less heat than incandescent light bulbs and are less fragile than fluorescent lamps. Since an individual device is smaller than a centimetre in length, LED-based light sources used for illumination and outdoor signals are built using clusters of tens of devices. Incandescent light bulbs for traffic signals and pedestrian crosswalks are gradually being replaced by LED clusters. Lighting systems using incandescent bulbs are cheap to buy but inefficient, generating from about 16 lumens per watt for a domestic tungsten bulb to 22 lm/W for a halogen bulb. Fluorescent tubes are more efficient, from 50 to 100 lm/W for domestic tubes (average 60lm/W), allowing large energy savings, but are bulky and fragile and require starter circuits. LEDs are robust and moderately efficient, up to 80 lumens per watt (but the average commercial LED outputs 32 lm/W). Thus LEDs are expensive, although their cost is falling. The technologies for LED production are developing rapidly. Because they are monochromatic, LED lights have great power advantages over white lights where a specific color is required. Unlike the white lights, the LED does not need a filter that absorbs most of the emitted white light. Colored fluorescent lights are made, but they are not widely available. LED lights are inherently colored, and are available in a wide range of colors. One of the most recently introduced colors is the emerald green (bluish green, about 500 nm) that meets the legal requirements for traffic signals and navigation lights. The largest LED display in the world is 36 metres high (118 feet), at Times Square, Manhattan. There are applications that specifically require light that does not contain any blue component. Examples are photographic darkroom safe lights, illumination in laboratories where certain photo-sensitive chemicals are used, and situations where dark adaptation (night vision) must be preserved, such as cockpit and bridge illumination, observatories, etc. Yellow LED lights are a good choice to meet these special requirements because the human eye is more sensitive to yellow light (about 500 lm/watt emitted) than that emitted by the other LEDs. There are two types of LED panels: conventional, using discrete LEDs, and Surface Mounted Device (SMD) panels. Most outdoor screens and some indoor screens are built around discrete LEDs, also known as individually mounted LEDs. A cluster of red, green, and blue diodes is driven together to form a full-color pixel, usually square in shape. These pixels are spaced evenly apart and are measured from center to center for absolute pixel resolution. Most indoor screens on the market are built using SMD technology — a trend that is now extending to the outdoor market. An SMD pixel consists of red, green, and blue diodes mounted on a chipset, which is then mounted on the driver PC board. The individual diodes are smaller than a pin and are set very close together. The difference is that minimum viewing distance is reduced by 25% from the discrete diode screen with the same resolution. Indoor use generally requires a screen that is based on SMD technology and has a minimum brightness of 600 candela per square metre (unofficially called nits). This will usually be more than sufficient for corporate and retail applications, but under high ambient-brightness conditions, you may need more punch to compete. Fashion and auto shows are two examples of high-brightness stage lighting that may require a higher LED brightness. Conversely, when your screen may be in a shot on a television show, the requirement will often be for lower brightness levels with lower color temperatures. For specific projects, you need to take into account factors such as sight lines, local authority planning requirements (if the installation is to become semi-permanent), vehicular access (trucks carrying the screen, truck-mounted screens, or cranes), cable runs for power and video (accounting for both distance and health and safety requirements), power, suitability of the ground for the location of the screen (check to make sure there are no pipes, shallow drains, caves, or tunnels that may not be able to support heavy loads), and overhead obstructions.